Component leaders and partners involved in the implementation of the YIIFSWA program in Nigeria met on 9 December, in IITA Ibadan for a two-day consultative meeting with the Farmer Organization Support Centre (FOSCA ). 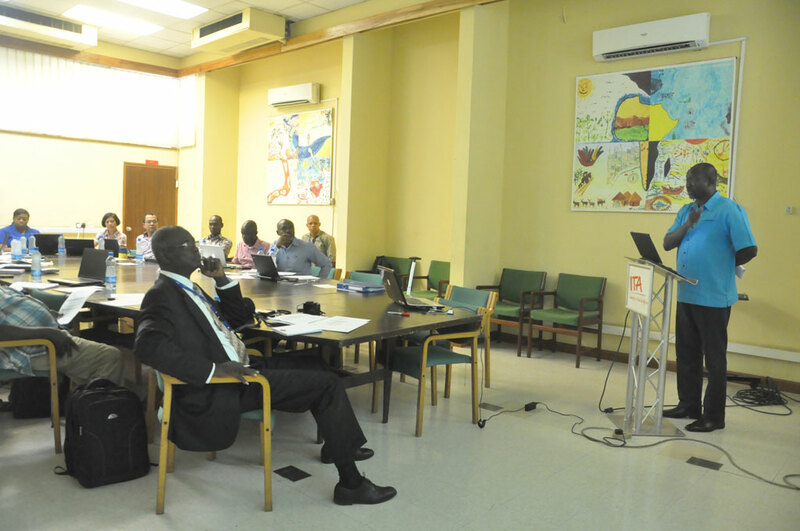 The meeting examined options for updating the database and ICT platform that will host YIIFSWA data and assist researchers and partners in the implementation of YIIFSWA. According to YIIFSWA’s Project Manager, Dr Norbert Maroya, the objective of the meeting was to discuss and develop a system towards ‘’synchronizing in a single database all data and information on YIIFSWA project beneficiaries engaged by the various component objectives’’. FOSCA’s Lead Coordinator, Mr Fadel Ndiame, who started the session with a presentation, stated that it was important to consider the required format preferences of the various objectives and partners in consolidating the YIIFSWA database. The database consolidation process requires inputs from all Objectives to contribute information towards institutional set up and define parameters for its sustainability and usefulness beyond the life of the project. Components and Coordinators of Objectives 3,4,5,6, and 7 also gave presentations on the data collated and to be collected on farmers and other beneficiaries. Each highlighted information needs and discussed how to capture and incorporate it into the soon to be developed YIIFSWA database. Action points were then set up for further interventions. They include the development of a roadmap for a seed system, the submission of datasets to the FOSCA Team for upload by all the Objectives, the development of a knowledge protocol and typology of production systems and farmers, and the production of a concept note on the Yam Development Forum.